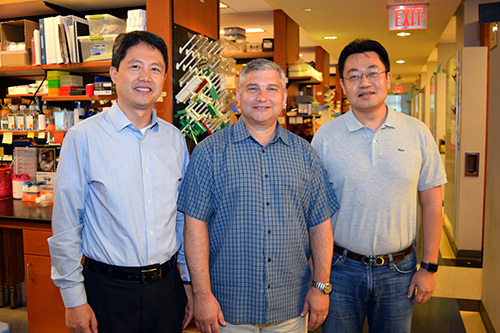 Faculty members Wei Zhou, PhD, Larry Boise, PhD, and Jing Cheng, PhD, have been named to new leadership roles in two of Winship Cancer Institute's prestigious cancer research programs. Winship Cancer Institute of Emory University has announced several leadership changes in two of its prestigious cancer research programs. Larry Boise, PhD, will serve as interim program leader of the Cancer Genetics and Epigenetics (CGE) Research Program as Winship launches a national search for the role formerly filled by Paula Vertino, PhD. Wei Zhou, PhD, will assume the role of co-Leader of the CGE Program. He succeeds Jin-Tang Dong, PhD. Jing Chen, PhD, will assume the role of co-Leader of Winship's Cancer Cell Biology Research (CCB) Research Program. Chen joins CCB Program Leader Erwin Van Meir, PhD, in overseeing the development and future direction of the group.